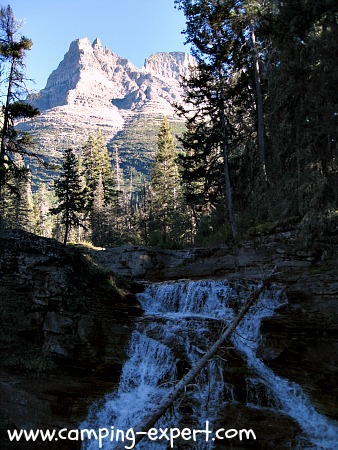 Glacier National Park Montana : Should you go? I'll share!!! On my camping road trip, we visited Glacier National Park Montana. What can I say? Incredible! Upon first entering the park, I asked the attendant what was her favourite national Park? She said “Glacier National Park of course!”. We thought she was kidding and perhaps a bit biased. Proceeding skeptically… we were definitely amazed! We weren’t expecting too much when we decided to take the only road through Glacier National Park, however we were impressed the entire highway. Throughout the park there are phenomenal views of Great mountains, waterfalls, drop offs and of course Glaciers! 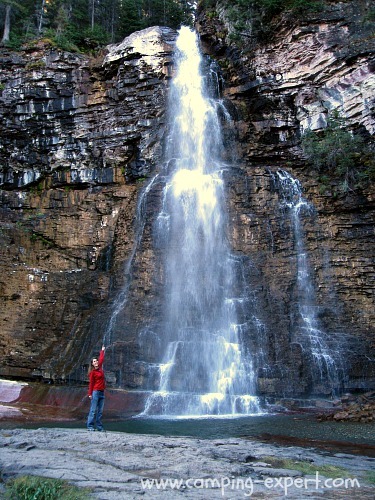 One of the many popular hikes is the St. Mary waterfall hike. This is a shorter hilly trail that has many waterfalls, although only 3 have names. The first bridge takes you to St. Mary fall with clear, blue, cold, glacier water. It looked tempting to swim until we dipped our toe in! I would highly recommend continuing to the finals falls of Virginia Falls. The final Falls, are absolutely spectacular! 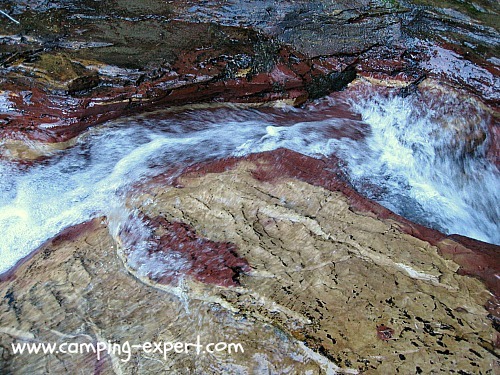 You can see the many layers of sedimentary rock that have formed over the millennia forming beautiful colorful rocks. The rocks also have old wave marks that have formed when the rocks were at the bottom of the ocean. There are many turn-off and view points throughout the park, and switchbacks galore! Making the drive very scenic, yet also potentially dangerous. When hiking on any of the trails, like any backcountry area, make sure to make some noise and beware of bears and cougars. Overall, we thoroughly enjoyed Glacier National Park, and wished we could have stayed longer! Nitty gritty information below (or visit the Glacier National Park website) (opens new webpage). 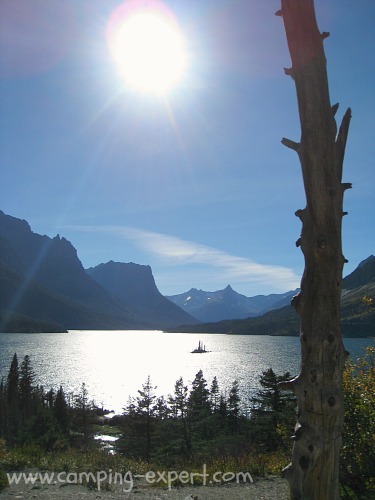 Glacier National Park Associates (opens a new window) is a volunteer organization that works in the park making trails, log building preservation and other projects. If you just want to visit for the day, then I'd highly recommend the Annual National Park Pass. Learn more about this awesome card here. 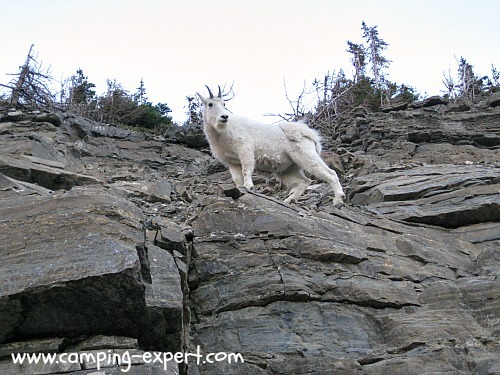 What can you do in Glacier National Park Montana? Star-gazing: The park offers a educational program called 'Half the Park Happens after Dark', where you can fully enjoy the stars without background city lights. Scenic drives: the drive through the park has INCREDIBLE views! Wildlife & wildflower viewing: There are many animals that call Glacier National Park home such as Moose, Deer, Bighorn sheep, Bears, Elk and many birds such as Bohemian Waxwing, Downy Woodpecker. Hiking: There are LOTS of trails in the park, intact over 200km (120miles) to suit every persons hiking and walking desire! Bison Paddock: a small herd of bison are near the north entrance by Hwy 6. Prices for camping? $10 for: Cut Ban, Logging Creek, Quartz Creek. $15 for: Bowman Lake, Kintla Lake. $20 Apgar, Avalanche, Many Glacier, Rising Sun, Sprague Creek, Two Medicine. $23 Fish creek, St. Mary (can be reserved in advance). Reservations or first-come first serve? Most camp-grounds (except Fish Creek and St. Mary) are on a first-come first-serve basis. How many sites? There are over 400 car camping sites. Group camping? Group sites can accommodate 9-24 campers. Sites are located at: 10 group sites at Apgar, 2 group sites at St.Mary, 1 at Many Glacier and 1 at Two Medicine. Bike or Hiker Camping? Hikers and Bikers can share campsites for $5 per night ($8 for St. Mary's). 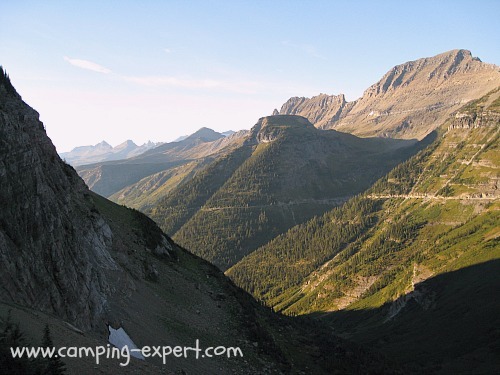 Check-out the other amazing camping places I've visited - with lots of pictures! Looking for new recipes for camping? Check out MY tried and true Backpacking Recipe book. All the favourites from all my guiding trips!